A visit to the Dubai Museum is a must on every Dubai itinerary. Housed within the beautifully restored Al Fahidi Fort which was erected around 1787 to defend the city against invasion, the museum’s diverse collection of exhibits offers a fascinating insight into the city’s rich history and cultural heritage. Renovated in 1971 for use as a museum, its colourful life-size dioramas vividly depict everyday life in the days before the discovery of oil. Galleries recreate scenes from the Creek, traditional Arab houses, mosques, the souk, date farms, and desert and marine life. One of the more spectacular exhibits portrays pearl diving, including sets of pearl merchants’ weights and scales. Also on display are artefacts from several excavations in the emirate. Wafi is a unique destination in the heart of Dubai presenting an unrivalled collection of fashion, food, entertainment and lifestyle, the best the world and the region has to offer. Indulge in a unique shopping experience, with over 350 stores offering the world's most original, revered and influential brands, many of which are exclusive to Wafi. Dating back to the late 1800s, Sheikh Saeed’s House was built in a commanding position in the Bur Dubai area at the entrance to Dubai Creek, so that the Ruler could observe shipping activity from the balconies. With its wind towers and layers of rooms built around a central courtyard, it is a fine example of regional architecture, and features a pictorial archive of early Dubai and the Maktoum family. 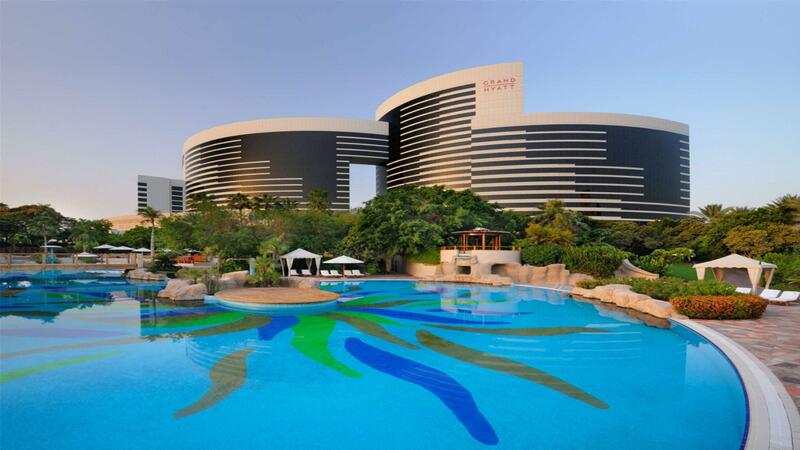 Located in the heart of the city, close to Sheikh Zayed road, Grand Hyatt Dubai is a perfect blend of city conference and resort set within a lush oasis of 37 acres of landscaped gardens. Featuring a combination of resort facilities, luxury hotel guestrooms and suites, residential apartments, 13 food and beverage outlets and one of the largest and advanced conference facilities in the Middle East, the hotel is just minutes away from Dubai’s shopping, entertainment and business districts and 10 minutes drive from Dubai International Airport. 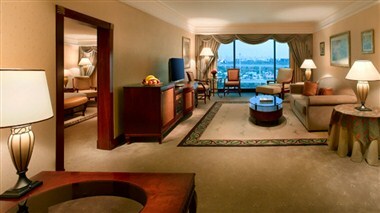 Unwind in one of our 674 luxury rooms and suites, featuring a swimming pool, creek or city views. 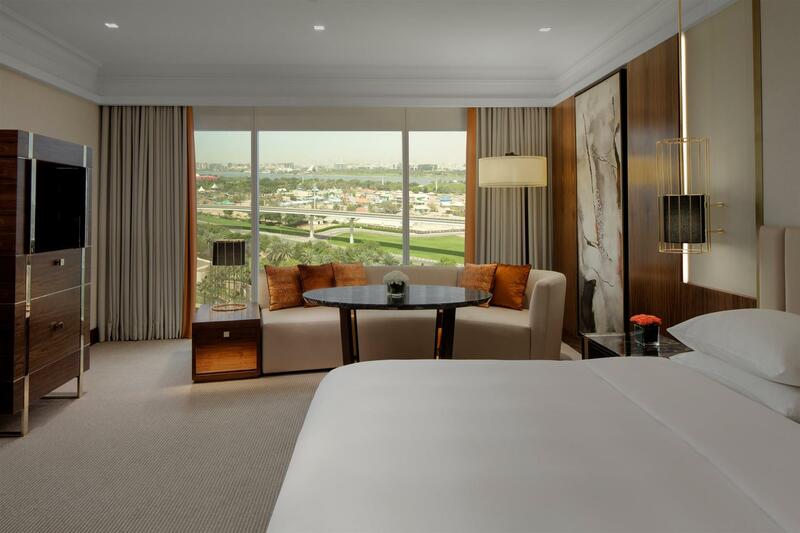 A modern and luxury hotel, Grand Hyatt Dubai’s spacious guestrooms and suites are fitted with every modern convenience required for a comfortable stay, such as luxurious beds, exquisite amenities, and elegant baths. Take a culinary journey to our renowned 13 restaurants and bars with cuisines as diverse as they are authentic. From authentic Lebanese cuisine at Awtar, Singaporean seafood specialties at Peppercrab, New York Grill at Manhattan Grill, Italian fare at Andiamo, Indian delicacies at iZ to international cuisine at The Collective. Guests also can also enjoy chill-out music at Cooz, a stimulating residential lounge, and bar. 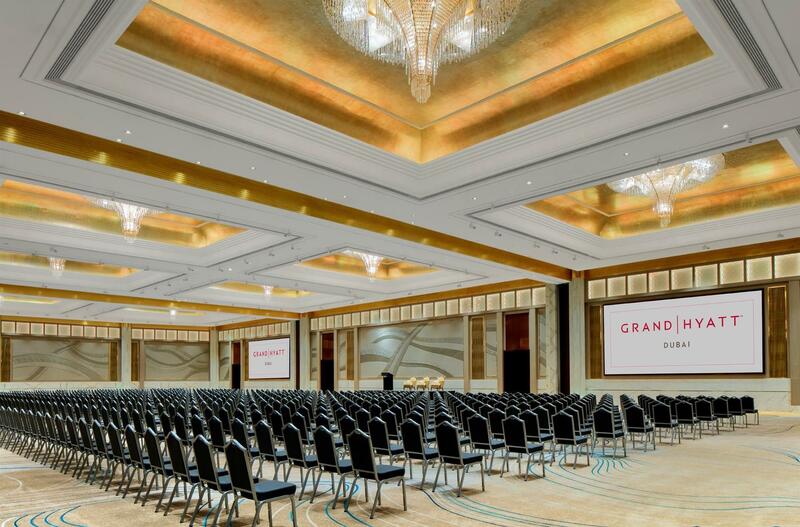 Grand Hyatt Dubai hosts the largest and most versatile hotel convention centre in the city. 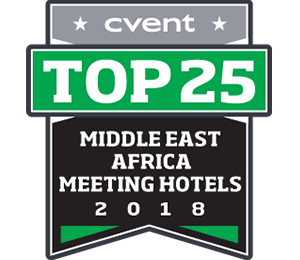 The 5-star conference venue provides 8,000 square metres of event space in Dubai featuring two ballrooms, 14 meeting rooms including Al Manzil, plus several areas for outdoor events. Let us assist you to achieve the height of meeting success with our well-equipped meeting rooms in Dubai. 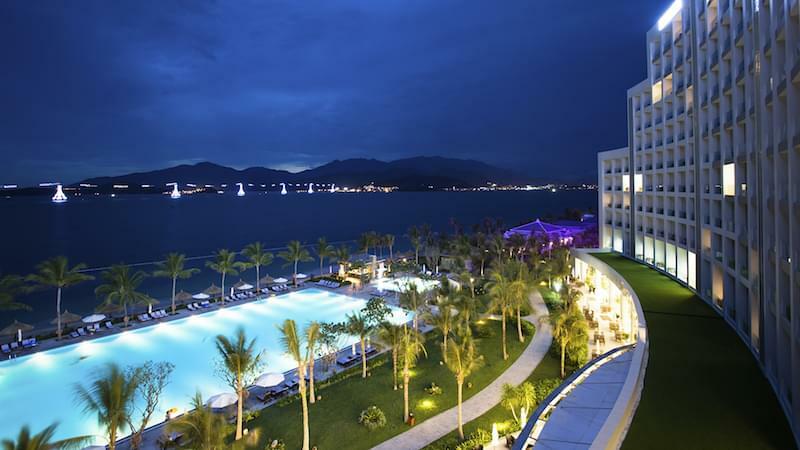 From corporate meetings to indulgent incentive breaks to global conferences on a grand scale, the range of possibilities is only limited by your imagination. 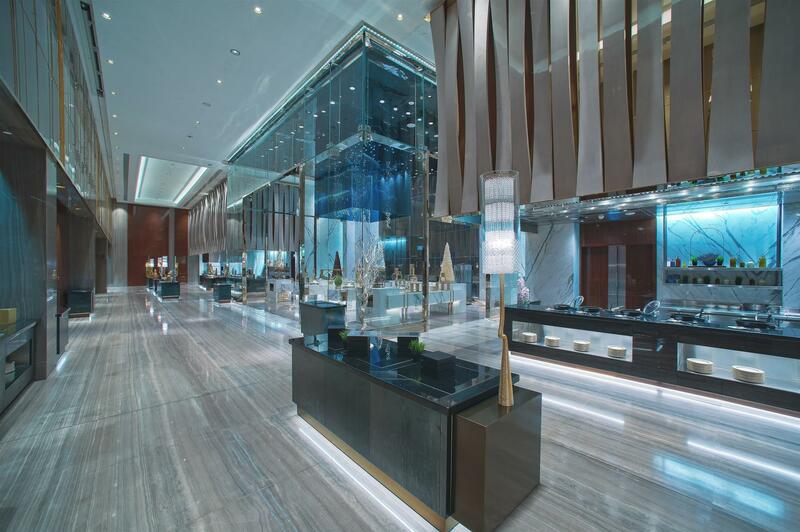 Grand Hyatt Dubai is equipped with ultra-modern digital technology, fast-paced communications and secretarial services. 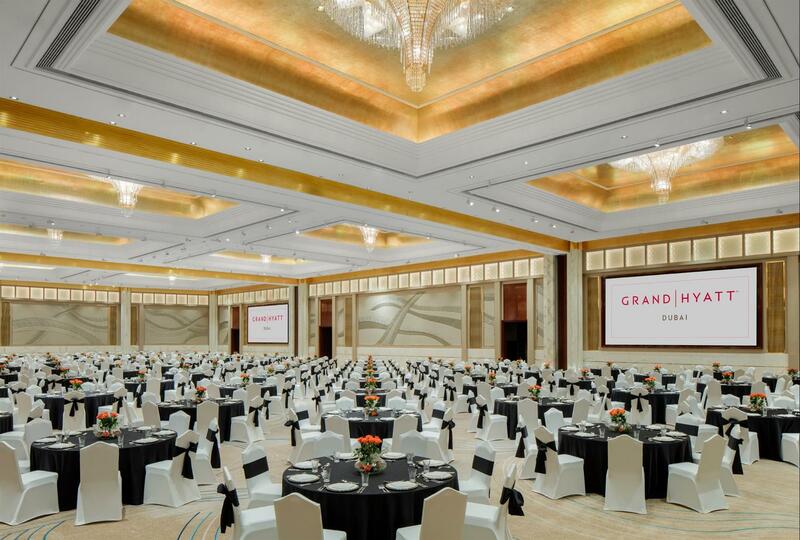 Welcome a new way to meet, mingle and motivate at Al Manzil, a brand-new residential style multi-event venue. Redefining the ultimate event experience, this intimately designed space embraces the style elements of Arabic hospitality and architecture, inviting guests into “The Home” for an event with exciting possibilities. 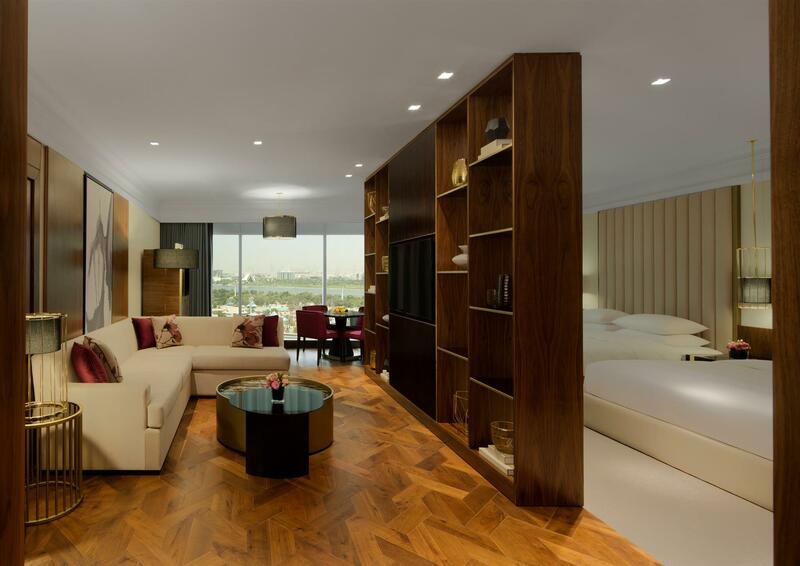 A pioneering concept in Dubai and the region, Al Manzil houses a unique show-break kitchen and six venues including meeting rooms, a lounge, a family room and a conservatory. From couture cocktails to meticulous meetings, indulgent evenings to wondrous weddings, Al Manzil is exquisitely staged to exceed the highest standards of hospitality. Relax and fully rejuvenate at Ahasees, our award-winning spa and fitness centre. With an extensive outdoor swimming area including three outdoor and one indoor pools, full complement fitness facilities and recreation space with a range of treatment rooms, every wellness and fitness need has been considered at Ahasees. For the pleasure of both adults and children, a 2,229,607-litre leisure outdoor pool, one of the largest in the city, offers the perfect antidote for busy and stressed lives. Children can enjoy their own pool complete with water games and slides, while a toddlers’ pool features a shaded canopy for total protection from the sun. The indoor facilities include a 20-metre; temperature controlled indoor lap pool with underwater sound system. For sheer indulgence, guests can treat themselves to one of the signature indulgent body treatments and be pampered into a state of lingering bliss by skilled spa therapists. For our young visitors, The Kidz Club in Dubai offers a world of fun, learning and exploration for children from five to 12 years old. From imaginative arts and crafts to interactive story telling sessions, music to cooking or feeding ducks, the kids club in Dubai presents children with an endless variety of kids’ activities in Dubai in a safe environment that nurtures their creativity and growth.